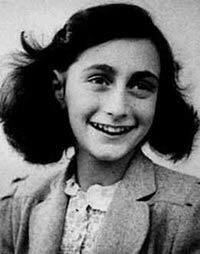 Annelies Marie Frank, or Anne Frank, was a very famous Jewish victim of World War II and the Holocaust. Throughout the two years that Anne spent hiding with her family in their secret location during World War II, she kept a personal diary. Her diary was published posthumously by her father and it chronicles her activities and experiences during this time. Millions of people all over the world have read her diary. Anne was born in June of 1929, in Frankfurt, Germany. She was the second daughter of Edith and Otto Frank. Her sister, Margot, was a couple of years older. The Frank family was middle-class and their ancestors had resided in Germany for hundreds of years. The family regarded Germany as their home and it was very difficult for all of them to depart Germany in 1933 for their new home in the Netherlands. They left Germany because of the anti-Semitic attitudes of the Nazis. Anne’s father first moved to Amsterdam during the summer of 1933, and there he established a Dutch firm that produced pectin. The rest of the family joined him in February of 1934. The family easily settled into their new life in Amsterdam. Anne and her sister attended school and quickly made new friends. Anne’s maternal grandmother left Germany in 1939 to join the family and stayed with them until she died in January of 1942. In 1940, German soldiers attacked the Netherlands on May 10th. The Netherlands surrendered just five days later. Once the Nazis were in control of the country, they began establishing many anti-Jewish edicts and laws. Anne could no longer attend school with non-Jews. In May of 1942, all Jews (age six and older) were forced to wear a Star of David that was yellow. The Frank family realized that just like in Germany, that death, as well as deportation was not far off for Jews living in the Netherlands. Otto started planning a way for them to escape. Since the Netherlands’ borders were closed, they could not leave the country. He decided that the family needed to go into hiding. In 1942, the family decided to move to their hiding place on July 16th, but the plan changed when Margot was given a call up notice on July 5th. The next day, the family left their home at 37 Merwedeplein and moved into their hiding place. Anne called their hiding place the Secret Annex. It was located at 263 Prinsengracht, her father’s place of business. Their hiding place was a three-story space that was located in the rear area of the building. A week later, another family, the van Pels, also moved into the hiding place. In Anne’s published diary they were called the van Daans. The family included Auguste, Hermann, and son, Peter. The last person to arrive at the hiding place was Friedrich “Fritz” Pfeffer, who was called Albert Dussel in Anne’s diary. On her 13th birthday, Anne received an autograph album and she decided to start using it as a personal diary. She started writing in it before she went into hiding. She wrote about her everyday life including items about her grades, friends, and about her ping pong playing. She continued writing her diary until August of 1944. Most of the diary details the stifling and cramped living conditions. She also wrote about the personality conflicts that occurred with eight people living so close together. Additionally, Anne wrote about her various hopes and fears, as well as different facets of her character. She said she often felt misunderstood by everyone around her. In 1944, on the morning of August 4th, many members of the Dutch Security and an SS officer arrived at 263 Prinsengracht. They went straight to the bookcase area that concealed the Secret Annex’s door. Everyone inside the Secret Annex was immediately arrested and taken to Westerbork. Miep Gies, a close friend of the family and an employee of Otto Frank, found the diary later that day. Anne and everyone else who had been living in hiding place were sent to Auschwitz in September of 1944. They were all separated at Auschwitz, and several were moved to other camps. Anne and her sister were transferred to the Bergen-Belsen camp in October of 1944. In either late February or in the beginning of March of 1945, Anne’s sister died from typhus. A couple of days later, Anne also died from typhus.